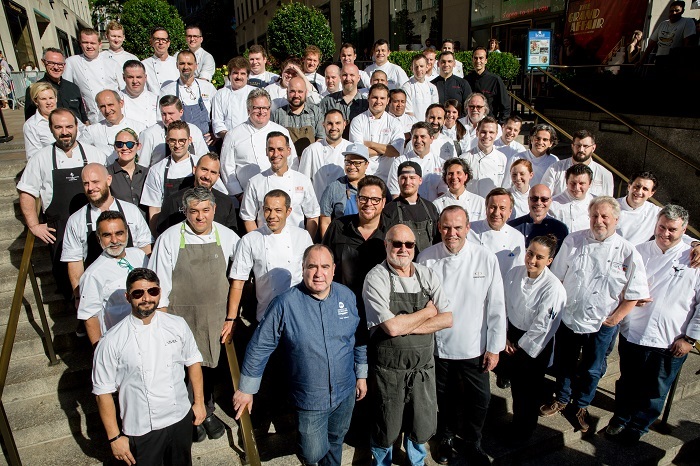 For the past 33 years, Citymeals has gathered the most brilliant minds in today’s culinary scene at Rockefeller Center to prepare and present unique dishes to over 1,000 guests. Returning luminaries Larry Forgione and Jonathan Waxman are joined by acclaimed chefs from across the globe including Chris Cosentino, Michael Gallina and Lucía Soria. Enjoy extraordinary cuisine paired with fine wines and cocktails brought to you by Belvedere Vodka, Courvoisier Cognac, Plantation Rum, Seedlip and Sipsmith Gin. VIP guests will indulge in exclusive tastings by Michael White and Angie Mar. See a list of this year's participating chefs. Keep the festivities going at the exclusive after party. Mingle with the event's culinary talents and sip bespoke drinks while taking in the city’s spectacular panoramic views. As always, 100% of the ticket sales and donations go directly toward preparing and delivering of meals to homebound elderly New Yorkers. Place an ad in this year's event journal. Guests are encouraged to wear festive attire. Ten tickets to the Patron's Lounge, located in The Sea Grill restaurant, providing early admission at 6pm and private entrance access. Guests will enjoy exclusive wines and dessert as well as a sampling of chefs' tastings from the event. Fourteen tickets providing early admission at 6:30pm and access to reserved seating in the VIP Lounge. Guests will indulge in exclusive tastings by Michael White and Angie Mar. Eight tickets providing early admission at 6:30pm and access to the VIP Lounge, where Chefs Michael White and Angie Mar will serve exclusive tastings. Five tickets providing early admission at 6:30pm and access to the VIP Lounge, where Chefs Michael White and Angie Mar will serve exclusive tastings. A pair of table seats in the Patron’s Lounge, located in The Sea Grill restaurant. Provides early admission at 6pm and private entrance access. Guests will enjoy exclusive wines and dessert as well as a sampling of chefs' tastings from the event. One ticket providing early admission at 6:30pm and access to the VIP Lounge, where Chefs Michael White and Angie Mar will serve exclusive tastings. One ticket providing early admission at 6:30pm. One ticket providing admission at 7:30pm. One ticket providing admission to Bar SixtyFive atop Rockefeller Center at 10pm.